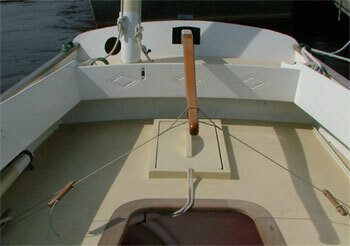 The outboard of the Romilly is fixed into a plug which slots into an outboard well which forms a female to the male of the plug. The outboard is held in place fixed here by a mix of gravity, leverage and surface tension. It works fantastically well and is a very neat and simple idea. 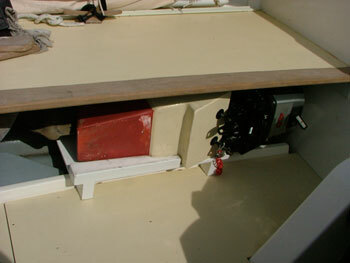 There is a blank plug which fits in when the outboard is removed, this fairs the hull. The picture showing the blank in place is of Speedwell, on my boat Riant Rob Dawson, the previous owner has fitted a small hatch to the top of the plug and it forms a convenient store for cold beer. When the outboard is in place the prop causes some drag so it makes sense to ship it before you start to sail. Both David, owner of Speedwell and Rob came up with a very similar arrangement for stowing the outboard under on a wooden “tray” which is designed such that the plug slots onto it with the outboard on its side. Here is my method of stowing the outboard motor. 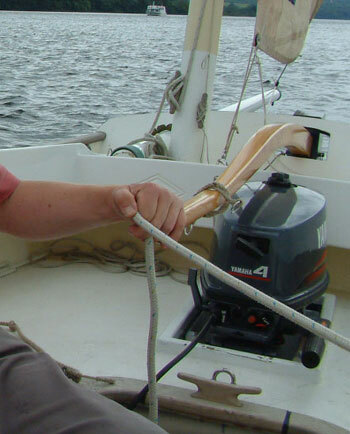 The outboard is a Mariner 4hp two stroke which jams neatly into place on a small wooden tray which is loose fitted. Gravity and a jamming action as the boat heels keeping everything in place. I wish I could think of a way of leaving it in the well, but raising the prop. to clear the water. I suffer from backache, and find shipping and unshipping the outboard is a contributory factor! I have a Honda BF5 with the standard propeller. I found that grinding (3/8”) and balancing the prop made it easier to insert and remove the outboard and prevent marine growth. At revs above 60% the prop now cavitates but then again I am already going 5 knots.